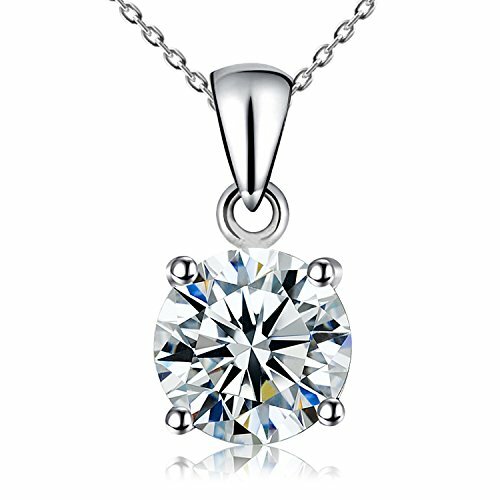 Kigmay Jewelry 925 Sterling Silver 2ct Clear Cubic Zirconia Solitaire Pendant Necklace Women, 16\"
This glistening pendant necklace comes with its own black velvet envelope, elevating this from an ordinary gift to a very special gift with style, class and elegance. This amazing necklace is fashioned with the highest quality Cubic Zirconia, and .925 Sterling Silver. It contains no nickel, copper or other allergens to irritate your skin. 30 Days Money Back Guarantee combined with world class customer service no question asked. Kigmay Jewelry offers best quality without compromise. We individually inspect each of our products, to make sure you are only getting the very best from us.